What is color? It’s a fundamental question about the way we perceive the world, but one many of us never pause to ask. 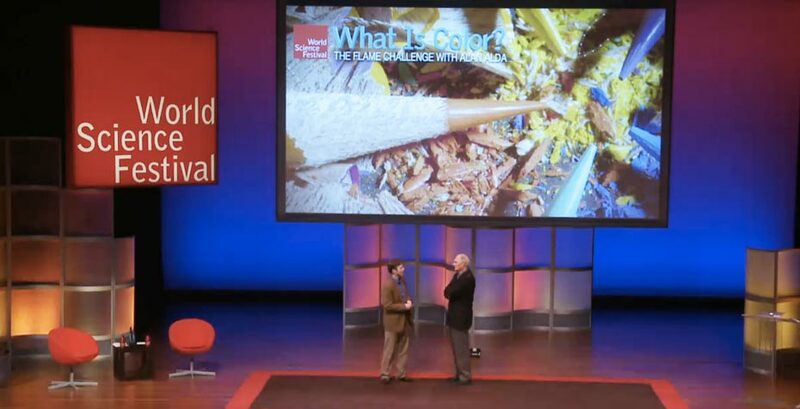 It’s the question addressed at the Flame Challenge, an event that took place in the 2014 World Science Festival in New York, when Associate Professor of Neuroscience Bevil Conway gave an interactive lecture in a sold-out event hosted by acclaimed actor Alan Alda and covered by popular art blog Hyperallergic. The event was sponsored by the Alan Alda Center for Communicating Science at Stonybrook University in New York, which works to train the next generation of scientists and health professionals to communicate more effectively with the public. The center’s annual contest, called The Flame Challenge, challenges scientists to explain a complex scientific concept (e.g., “What is a flame?”) to an audience of 11-year-olds in a way that is clear and engaging. Conway, a neuroscientist and visual artist, was among the three scientists invited to present a response to the question at the festival. Conway researches the neural basis of color, and the perception, cognition, and behaviors that form visual experience. He was part of the team that developed the core neuroscience curriculum at Wellesley, and teaches a number of neuroscience classes including an interdisciplinary course on color from both artistic and neuroscientific perspectives. Conway then illustrated this concept by setting up easels on stage and painting different-colored illustrations of a cube with the help of a young assistant. Two cubes that seemed to be different colors—one blue against a green background, one yellow against a blue background—were revealed to be the same color, much to Alan Alda’s astonishment. This surprising fact of color context is one that artists understand and use, Conway explained, highlighting the work of Henri Matisse, who used different-colored borders to illuminate his work.